Since beginning to livestream SA Senate meetings last February, an average of 753 people have tuned in every other week to watch. 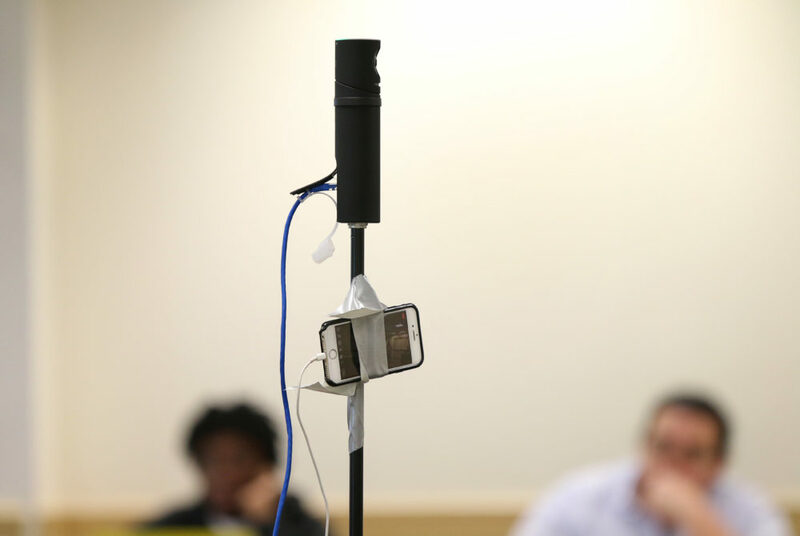 Room 309 in the Marvin Center can only fit about 150 students, but the Student Association Senate has used new technology to bring hundreds of students into the room for its biweekly meetings over the past year. Since beginning to livestream SA Senate meetings last February, an average of 753 people have tuned in every other week to hear the body debate legislation and approve new student body representatives. SA senators and students said the livestream is increasingly engaging more students in the group’s activities and helping students become more knowledgeable of the organization’s operations. 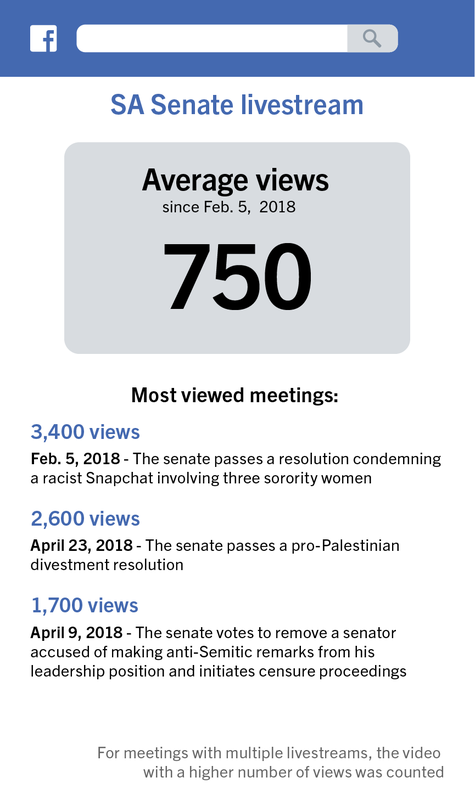 Over the past year, the most-watched senate meetings have included the senate’s debate over a resolution condemning a racist incident involving three women from Alpha Phi, a measure pushing the University to divest from companies that allegedly contribute to Palestinian suffering and a vote to remove a senator accused of anti-Semitism from his leadership position. Those videos – which were all posted last academic year – peaked at roughly 3,400, 2,600 and 1,700 views, respectively. This academic year viewership peaked when 469 people tuned into a senate meeting on Jan. 28 urging officials to help students better navigate their financial aid services. The number of views on live videos this academic year has fluctuated between about 200 and 400. James Harnett, a senior policy adviser to the SA and the organization’s former director of digital policy and innovation who set up the livestream, said the service has increased students’ awareness of the senate’s meetings, which could encourage more students to run for leadership positions during elections next month. “This could increase the interest that some students have in running for the senate or campaigning on their own ideas of how they want to make campus life better,” he said. Harnett said students who regularly watch the livestream have recommended that the SA condense footage so students do not have to rewatch the whole video if they are only looking for certain parts of the meeting. The SA currently airs the meetings on Facebook, which does not allow users to “bookmark” certain parts of a video. “It would be great if there was some way to sort of delineate what it was that happened and make sure students are staying in the loop about what’s going on,” he said. SA Sen. AJ Link, Law-G, said the live videos broaden access to SA meetings for students who are unable to be physically present for meetings because they may live off campus. SA Sen. Alvin Lam, who lives off campus, has frequently used the livestream to virtually attend senate meetings instead of sending in a proxy vote if he can’t commute to campus. Sen. George Glass, U-at-Large, said he often watched the livestream last spring while he was deciding whether to run for a senate position. “It’s important that we have that means of broadcasting ourselves to a wider audience to make ourselves more accessible and transparent overall,” he said. Junior Nassim Touil, the SA’s vice president for financial affairs who regularly watches the SA livestream, said he watches the footage at times when he is off campus or when there is inclement weather. He said the service is an “invaluable” platform that allows students on and off campus to be more aware of passed legislation. 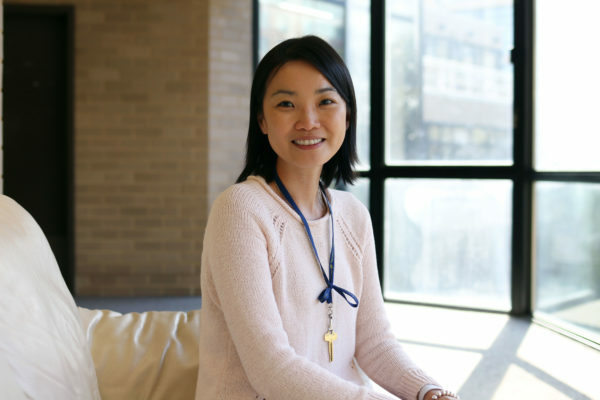 “Because the SA does work on the student experience, I think for such a large body it’s important to keep up to date and see what’s going on and what’s happening,” Touil said. Owen Park, a member of the SA student engagement committee, said he typically views the livestream for five to 10 minutes so he can find out whether legislation was passed. He said watching SA meetings on a livestream is more convenient than attending meetings because he can choose to tune in and out at different parts. “It can provide a good snapshot of how things work within senate meetings,” he said. Sophomore Caroline Lloyd, who watches the senate meetings every other week, said it is easier for her to keep up with SA activities online than to attend meetings in person because she has a chronic illness. 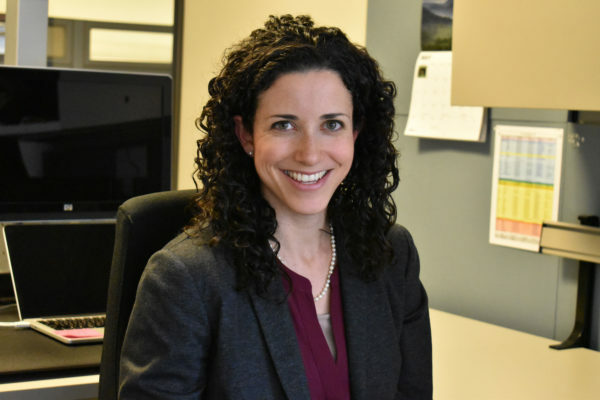 She added that if students are involved in multiple student organizations and their gatherings conflict with senate meetings, students can watch senators debate on the livestream after their other obligations have ended. “I think the livestreams are beneficial since so many students are involved in multiple organizations and often won’t have availability to attend in person,” she said in an email. This article appeared in the February 21, 2019 issue of the Hatchet.